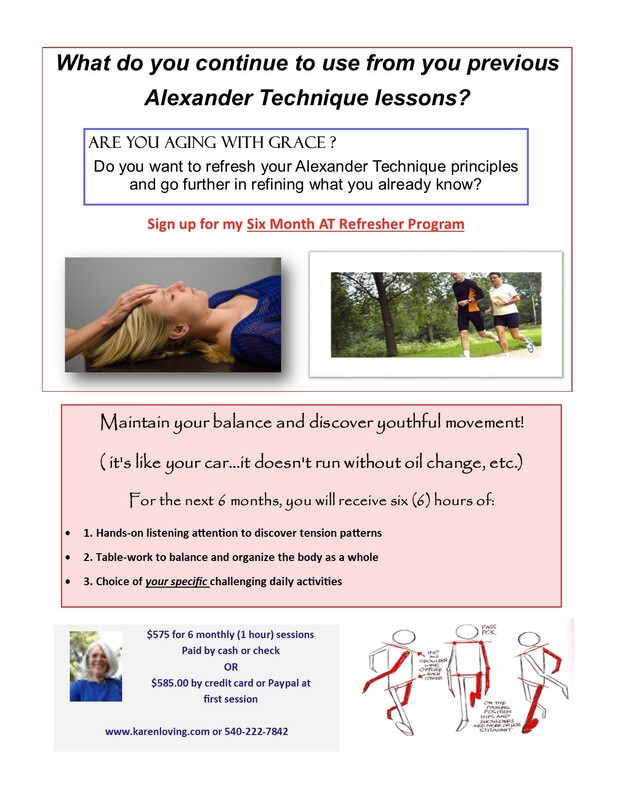 Do you want to refresh your Alexander Technique principles and go further in refining what you already know? This entry was posted in General info on October 9, 2018 by karen5022. My client, Darrell (not real name) has had lower back pain for many years; and the other day when we were working together on postural habits and walking; he discovered that if he pushed into his foot too hard with excessive effort, his back pain flared up. So we explored how he could place each foot on the ground with “just enough” weight to keep balance and good posture and his back pain subsided. He used the term “efficiency in movement”. Darrell went off feeling so empowered that he could now do something in his daily activities that would change the pattern he had been using for walking to a more “easeful” way to move that relieved his discomfort. He realized it was about practicing new ways of learning about his body and his movement. This entry was posted in General info on January 14, 2018 by karen5022. Mia (not real name) attended the last workshops series on how to find our graceful, strong body. And she shared with us what she had discovered after the workshop we did on walking. She loves to walk her dog however, her right hip was always getting her attention because it was so painful. When we started to look at how the freedom in her ankle related to the freedom in her hip; a light went off in her awareness and she could now make a choice on how she was walking and let her ankles be easy and her hip pain subsided. She said, “I know I will have to be more attentive to changing my patterns of walking. This is a practice I can explore on my own. The next workshop series is coming up next Tuesday in Culpeper (11-12:30) and Thursday at White Flower Studio in Warrenton (1-2:30). Come see what you can discover about your movement to find grace, poise and postural balance. BALANCE – an even distribution of weight so there can be suspension or poise to remain upright. I think of this when I pause and notice if my feet are on the ground and under the weight of my body. Can we consciously be aware of the balance of our bodies? Sunday morning pondering! This entry was posted in General info on January 4, 2018 by karen5022.